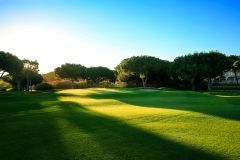 The Pinhal Course, flowing over the hills of Vilamoura, is the second-oldest course in the Vilamoura resort, and like the Old Course was designed by the esteemed Frank Pennink. Since its inception in 1976, the Pinhal has been improved, most notably by Robert Trent Jones in 1985, and remains one of the top courses in Portugal today. Found by the popular coastal town of Vilamoura in the heart of the Algarve, the Dom Pedro Pinhal is ideally situated for groups of golfers who are looking for a fun round before hitting the town. Pinhal has long been a favourite among returning golfers, as one of best courses in the Algarve it is a worthy addition to any golf break. We found 35 offers matching your search. The predominant character of the course comes as a result of the rolling landscape that is heavily populated by Umbrella and Atlantic Pines. These trees are frequently obstacles to the visiting golfer, while there are also streams and a lake that can be decidedly tricky. To keep up with the advancements in golf technology, the Pinhal recently lengthened a number of holes, and the resultant 6,947 yards is a genuine pleasure to play during a golf escape in the popular resort town. course well looked after. in general the green fees were quite expensive. even vila sol was over the top on price, very good otherwise. We didn’t have the best of starts. We were a group of 6 playing as two 3’s throughout our break, playing as teams as well as individuals. They insisted that two unknow players were to join us, making us two 4’s, thus abandoning our team competition. After a heated conversation we managed to get it resolved. Decent course, but really tight, some of the trees are ridiculously located. The greens were good and more receptive. Liked this course a little more than the others. We have played this course three times and it is a good course regarding difficulty to finish on. Enjoyable golfing experience even for a high handicaper like me. Tree lined fairways and doglegs. For the good golfer with drives that are true it would not be that difficult. Another stunning golf course. Thoroughly enjoyed the round. I enjoyed this course. I accept that there had been heavy rainfall the night before but there was a lot of standing water and the greens were all over the shop. one would be ridiculously fast then the next really slow. It was difficult to get a rhythm going. Very nice course however the greens seemed tired. Nice to have a refreshment hut halfway round. Like the other courses stay out the water and you will always have a shot. Enjoyed the course with a good variety of holes but was disappointed with the fairways as these were quite wet which lead to a lot of mud balls. The buggie situation was a shambles, pack them and stack them situation with players. Will not go back again. cannot pre-book buggies, therefore it's a gamble if you want to book whilst you are there, no buggies some players were walking and with a group of 16 player walking split the group up, therefore the course was very slow, as it's a long walk between green and tee, been here 3 years on the trot wouldn't return, service is poor and gone backwards, over crowded the course and staff don't care! Waiting to take shots due to slow play first round was frustrating,it improved the second round people seemed to struggle with the trees slowing things down. Some nice holes.